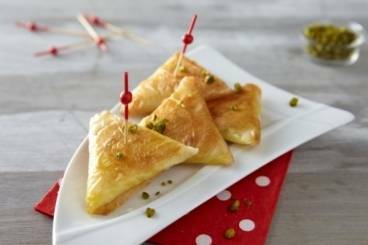 Crisp filo parcels filled with Saint-Marcellin cheese, crushed pistachios and bresaola. Perfect served as an aperitif or light starter. Cut the Saint-Marcellin cheese into centimetre dice. Cut the bresaola into thin slices. Cut the strips of filo pastry into 3cm wide strips and brush with olive oil. Place a couple of pieces of cheese on one end of each strip of the pastry and season with pepper. Sprinkle with crushed pistachios and add with a piece of bresaola. Fold the pastry across itself to form a triangle at the end. Repeat until you reach the other end of the pastry strip and you have a samosa shaped parcel. Repeat until you have used up all of the pastry. Heat a frying pan to hot and add olive oil. Cook the pastries for 2 minutes on each side. They should be crisp and golden brown. Enjoy immeditely or serve with a fresh green salad.